​Our latest selected projects are posted on our DANF Blog. Lender can fund and collect payments directly from the borrower when he provides 100% amount of project fund. It's an option for lender who would like to build their relationship with borrower. Please advice us on you registration form. A repeated borrower or qualified sponsored organization who has the defaulted rate is less than 1% which is less risk to DANF's lending capital. Our selected projects have “no string attach”. DANF has no prior information or relationship with these borrowers. Our decisions are solely based on their presented facts. DANF is solely responsible for these defaulted loans if it occurs. DANF works with our strategic partners such as Kiva. DANF will lend a microloan to each project. 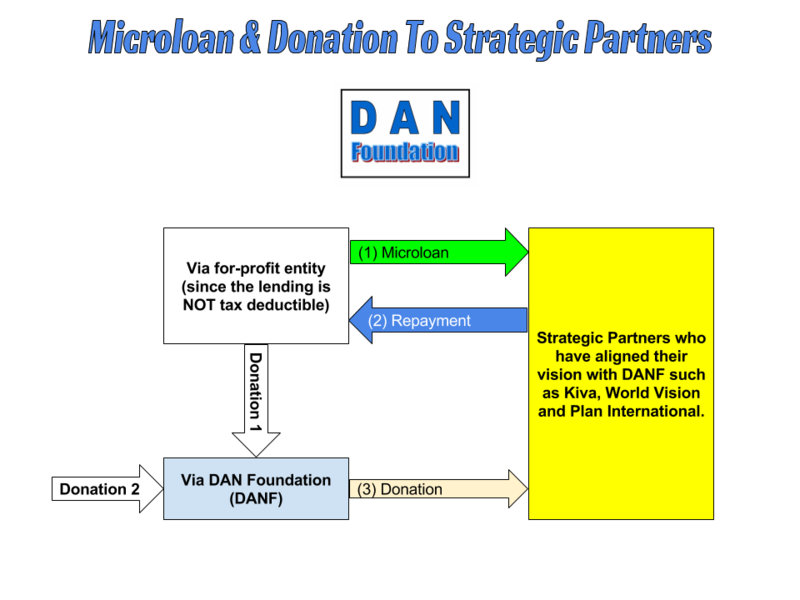 Once our microloan repay in full, DANF will donate this total repayment to our strategic partners such as Kiva organization, World Vision or Plan International. Please note all your contributions to our DANF's operating expenses 100% is tax deductible. If you are compelled wanting to support our DANF’s mission, please volunteer and donate to us.